I have made mistakes in my life. Its true. I also have learned to accept the consequences and take responsibility. It sounds easier than it is, but it seemed necessary and important. I have been on a growth journey learning to be completely honest. IT has been rewarding, albeit painful. I was about 7 years sober when I moved to Idaho. I had applied for a medical license here after having trouble in Colorado. It is a long story that can be gleened from my other posts. I met with the board here and they offered me a stipulated license. I commented that if that was going to be, please just dont give me one as it is pretty useless when stipulated. I had applied for 500 jobs and couldnt get one because of the stipulation. The board understood and awarded me an unrestricted license if I would voluntarily submit to random urinalysis tests. I agreed. The way it works is every morning you call into the screener. I have an image of the banks of computers like in the 70’s evil genius movies. The computer then identifies you and whirls its wheels to determine if you should submit your liquid gold that day. In an even tone, the computer voice then tells you that you have not been chosen or you are chosen. I was never chosen for teams in grade school, so this confuses me a little. I want to be chosen, to vindicate my 8 year old chubby self. But I dont want to be chosen because of the hassle that will follow. This day I was chosen. I am elated and bummed. After they know you, they will get you in quickly. This is good, because generally you present needing to pee badly. The program changed after I started and all the urine collections had to be observed. This never really bothered me, but many people talked about having a shy bladder. I cant imagine exposing yourself to some stranger and then not being able to pee. It would prolong the discomfort. What do you say at that point? “Sorry, it was working earlier”? One of the guys who watched us pee was a very large guy. He had the shape of the guy in Green Mile. His teeth were not as straight nor his voice as deep. His fingers were at least 2 feet long. If I stand up very straight, I can be 5 foot 7. My fingers are average and my voice is also not as deep as the Green Mile guy. There is no guy I have ever met that doesn’t wonder if he is long enough below the waist. The average size has decreased from 6.3 inches to 5.5, reportidly. A popular wives tale about the size of hands reflecting the size of genitalia has never been proven clinically. As the Green Mile stand in leads me to the bathroom, these are not the facts that cross my mind. I can feel my testicles hiding in my abdominal cavity. I wonder if I will ever be able to pee. I have a thought that as I prepare, this massive guy is going to giggle and pat me on the head and say, “Good for you, little fella.” I was able to pee and two days later my testicles emerged. I have not had to pee for points in a few weeks, having completed the requirement. I still get up, drink my coffee and water and about 10 am need to pee. I consider holding it at noon every day and have often wondered if I will ever be able to spontaneously urinate without Green Mile watching me. I think my house is being bit. I understand it sounds delusional, but I am looking out my windows and there are these long pointed teeth everywhere. When I open the door, I can feel the icy breath curling around my bare ankles. It nibbles at exposed skin. Perhaps the mouth biting my house is an alien life form and there is little nibbling heads within that like flesh better than dwellings. I cant be certain because I close the door quickly. On a particularly adventurous and brave day, I went out and knocked out some of the teeth. I figured that perhaps it would save my house if I forced the frigid being to gum my house instead of chew. I strutted around in the 30 degree weather, thinking I had bested the wintery beast. I treated myself to popcorn and apple cider. I had won. I had outwitted the monster. I awoke the next day to 4 degree weather. The teeth had returned. I think they were bigger than before. I was dejected. I soothed my troubled and cold self with popcorn and apple cider. The wind is blowing and the sounds of chewing plop from the trees. The nibblers sneak in the drafty spots. I shovel off the frozen saliva from the porch and driveway. It is stacked everywhere. The frozen froth fills my yard and the street. The beast is hungry. We had a very mellow good time. We even went grocery shopping. We made meals and watched Sons of Anarchy. We laughed and just enjoyed each other. I was looking in the pantry this morning and I cant find my cereal. There are 2 very large onions, some potatoes, and I think a box of pasta helper I didn’t buy. I also have a new toaster but I am not sure what happened to my frying pan. He is a little hard of hearing and has a knack for starting conversations as you leave the room. I found myself holding my pee several times while he asked about something or told me a story. I also find myself whispering throughout my day because I find myself talking very loudly whenever I am around him. I slip into interpreting and repeating when we are out at restaurants or in stores. The day after he left I turned on the TV and panicked as the loud explosion on the show reverberated through the house. There was a brief minute, right after I nearly wet my pants, that I forgot that I could turn down the volume. We drive each other absolutely batty sometimes. We are good friends and enjoy each other most of the time. I am baffled by him frequently. I am amused by him as well. There are few people in this world I trust and respect as much as him. Its nice to get to pee when I need, recognize the food in my cabinets, and not feel the need for prepared answers when I use the lazy tool. I can have the TV at a volume that wont frighten airplane pilots. I have been working out. That is nothing new, I have always enjoyed the gym. It is great people watching. I find that the flexing in the mirror has gotten much more secretive in the last decade or so. When I first joined the gym, it seemed that part of the routine, if you were of a particular size, was to stand and flex in front of the huge mirrors. It was preening behavior. I thought it was silly until I saw the thong club drift over to watch. I confess, I have flexed in a mirror hoping the thongs would arrive. Sadly, they never did. Years ago, I tried to do spinning class. I really enjoyed it. I have always been a bike rider and thought I was pretty hot stuff in the class. I mused over the instructor in matching sponsor shorts and shirt. I thought it would be an easy stroll. She mounted the bike and said, “My name is Meredith, I am a professional cyclist.” My legs still hurt 5 years later. So, Ive been working out. I have been doing the stair master lately. I figure there are no stair master professionals. I am considering doing the ½ Ironman competition in the summer and thought it might be a good idea to do a little more cardiovascular training. I generally do 30 minutes, but decided yesterday to do 45. A brief history, I do this at the end of my work out. When I am done, I am not moist, not spritz, I am drenched. I sweat. I am also a math nerd. I like math. I make math problems out of addresses, license plates, and phone numbers. I muse when there is a math problem within the serial numbers of dollar bills. So, as I am sweating and climbing, I am also doing math problems on the number of floors I should obtained when the blinking hill demarking my current torture is completed. Generally, minutes ago as I walked the Green Mile to the stairs, I was setting a goal on how many floors I would climb that day, including a pace and heart range. See, I am a math nerd. Today is my 48th birthday. I am 8 1/2 years on the road of Happy Destiny. I am 3 years out of a bad marriage. I am 6 months into a “do-over” on my career and life. I am about 3 days into the recognition that I take myself too seriously re-struck its disharmonious chord with me. I have had a tumultuous few years and have had to start my life all over a few times before I could gain purchase. I even fell in love since the divorce, but was so panicked about loosing it, I lost it. When I did a week at a counseling center in Arizona, the counselor suggested to me that I was way to serious and had lost touch with my inner child. I had never been told I was too serious before. It was odd to me. I had lost my smile and the joy in little things. However, I thought I had been getting them back. I had moved and started teaching. I felt like I would be ok even though I was unsure how. This was one of the steps to get a license in Idaho and restart my medical career. Things were looking up. Serious? me? She thought so and suggested I go to Build a Bear and design my inner child. I did. 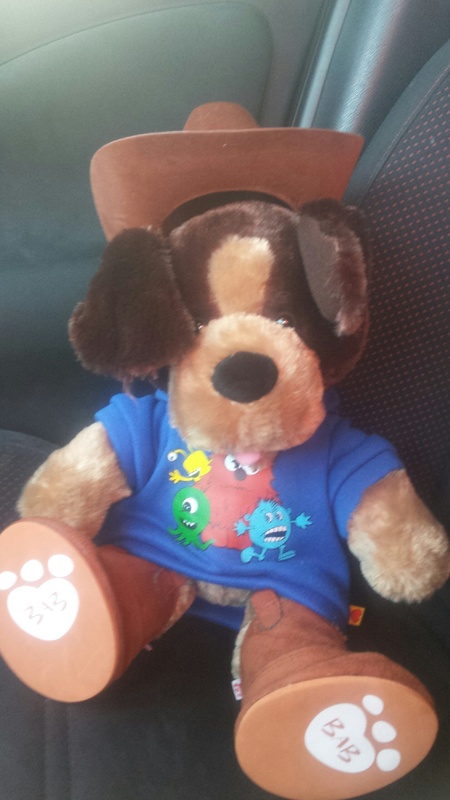 He rides around with me in my car. This is his, “Are you serious?” look. Still I have been feeling lost and separated from myself for some time now. I am unsettled and lonely. I have gotten stuck in the quicksand of my past. I have screamed and hollered. I have begged and pleaded. I have not moved on. I couldn’t let go of what I knew for the unknown. I was scared of my life and of myself. I didn’t trust me or God. “You just have to know that God is protecting you, you are safe,” she said. “You will be ok,” my old life said. I forgot to enjoy the present. I forgot to enjoy me in the present. I am not that miserable guy. I like to laugh. I enjoy to have fun and do silly things. I remembered in an unusual way. I set about the task of making my new house my new home. I was dismantling the shoddy shelving the previous owner built and was holding a jigsaw. I dropped it on my wrist and opened a gash in my arm. I stopped the bleeding and started looking for a needle and thread to sew it up. At one point, I looked at the wound and felt faint. I had to lay down. As I regained my composure, I giggled that I was thinking of suturing myself and I cant even look at it without feeling lightheaded. I called a friend to take me to ER, but said to wait about 5 minutes, so I could eat a sandwich. She giggled and said, “Are you serious?” I took pictures of the wound and posted it on Facebook so all could guess on number of sutures. I had fun in the ER, actually. I giggle each time my windshield taps these. 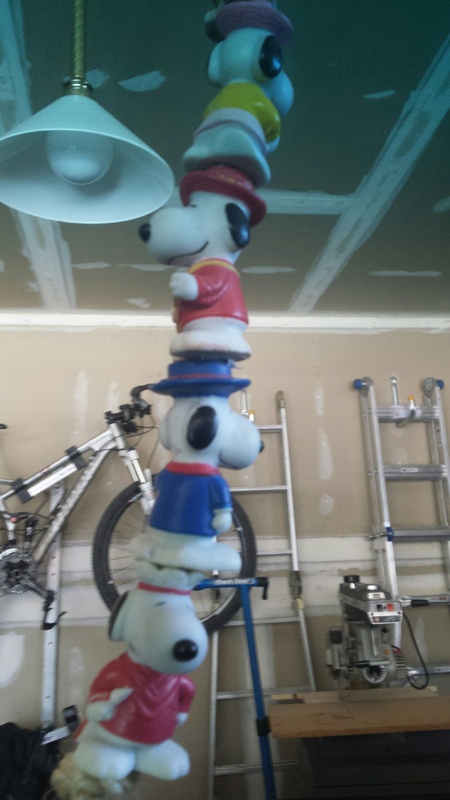 You will notice that I also hung my old kitchen lights in the garage to spruce it up. I was feeling lighter somehow. I felt like I recognized me. I had begun to trust that I would be ok. I recognized my perseverance. I recognize my character. I felt hope. On Sunday, in the education hour, we talked about Romans 5:3 and Romans 8:28. “From suffering comes perseverance, from perseverance, character, and from character, hope.” I was comforted and felt the hope. 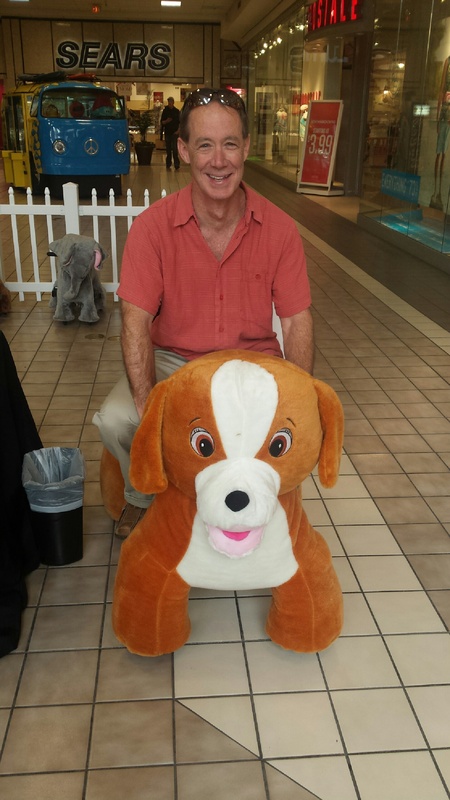 So I went to the mall and rode a motorized dog (it looks suspiciously like my inner child, Big T says). I am serious about hope. I am serious about life. I am serious about God. I am serious about hoping to have fun with my life and with my God. Comments Off on am I serious?